Those two technologies are coming together! Depending on the thickness of its air-supported wall cavity, FoamDome adds between R30 and R60 to the meagre (R2) insulation value of a single-membrane air-supported structure. The inner membrane floats on a pressure cushion created by the structure's main air-support blower. A second blower creates the foam and also supports the outer membrane. The soap-foam can be easily removed or re-positioned and is far less costly than glued-on insulation. 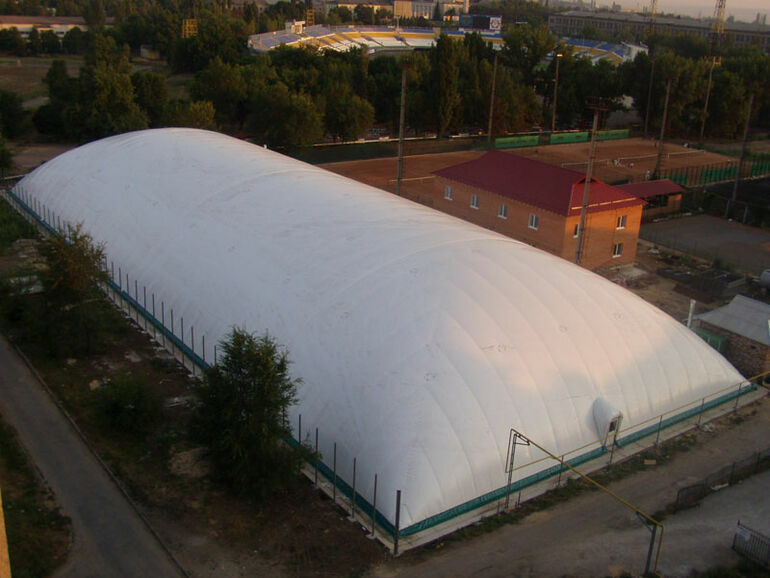 If the FoamDome's inner and outer membranes are transparent then it can serve as a large and versatile greenhouse. 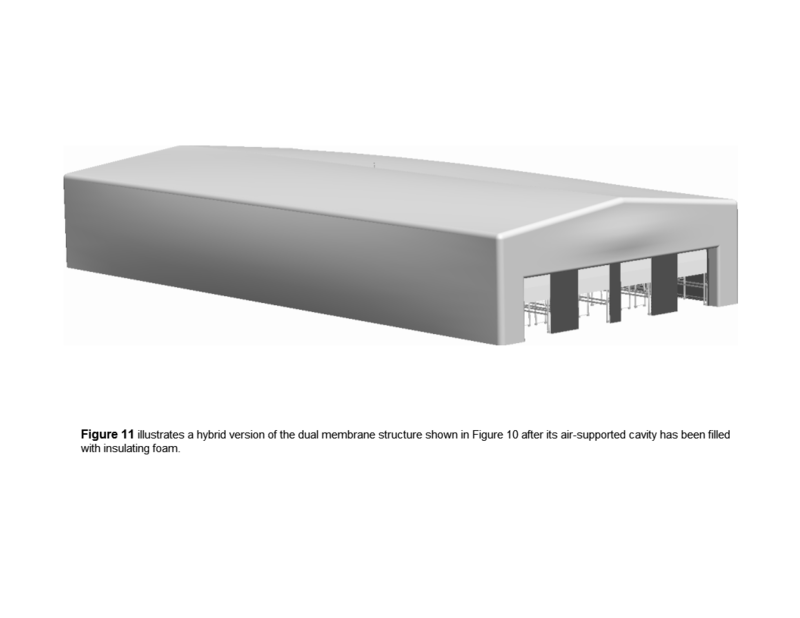 The foam can be independently pumped into different areas, to provide infrared heat blocking as well as cold insulation that suits the crop's changing needs. Filling or emptying the wall cavity takes just minutes. When emptying it, the liquified foam flows into a subterranean holding tank, where is can serve as a heat-sink. Liquid from the heat-sink can be pumped through the wall cavity to help regulate the temperature inside. 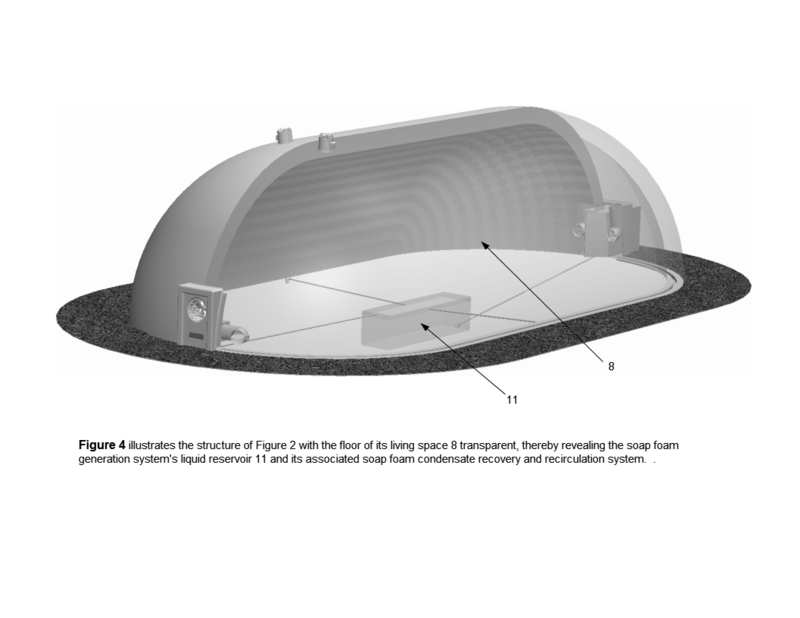 The low rate of natural bubble condensation enables the foam generator to only require a 5% duty cycle in order to maintain the structure's full R-value. 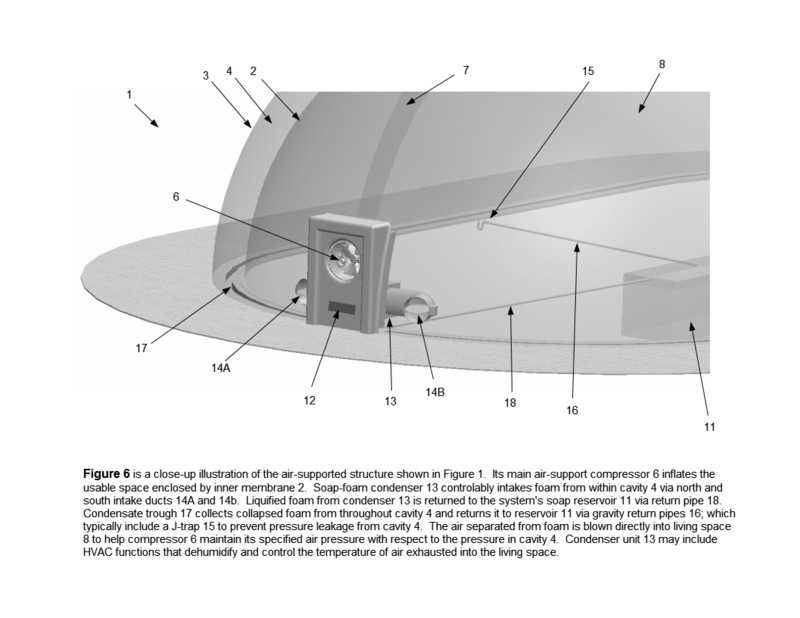 The extra hardware needed to create a FoamDome can be easily developed or configured from off-the-shelf components. The wall cavity can be ventilated while simultaneously cascading heat-sink fluid down its inner membrane. The aerated waterfall transforms the wall into a huge evaporative cooler! 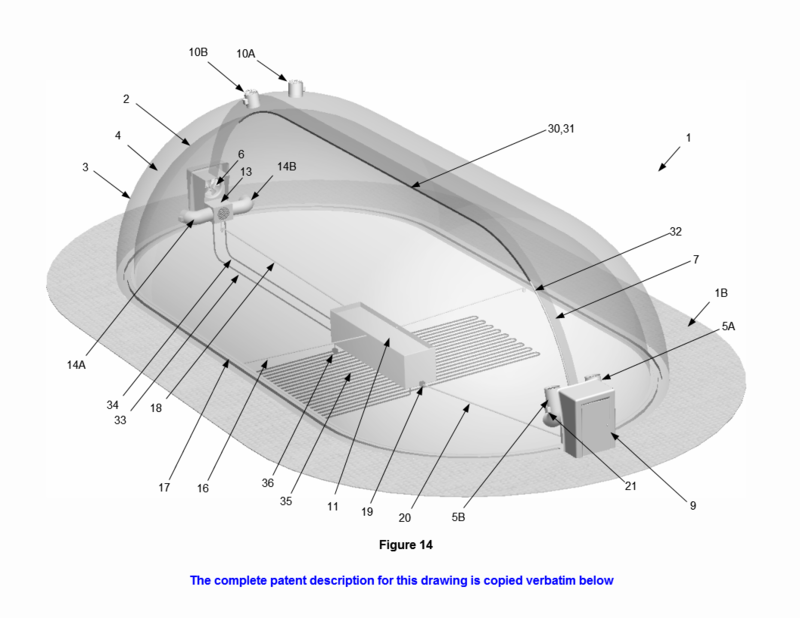 Figure 14 is a perspective view of the embodiment shown in Figure 13; it better illustrates the structure’s novel mechanisms used to provide evaporative cooling and geothermal heating. 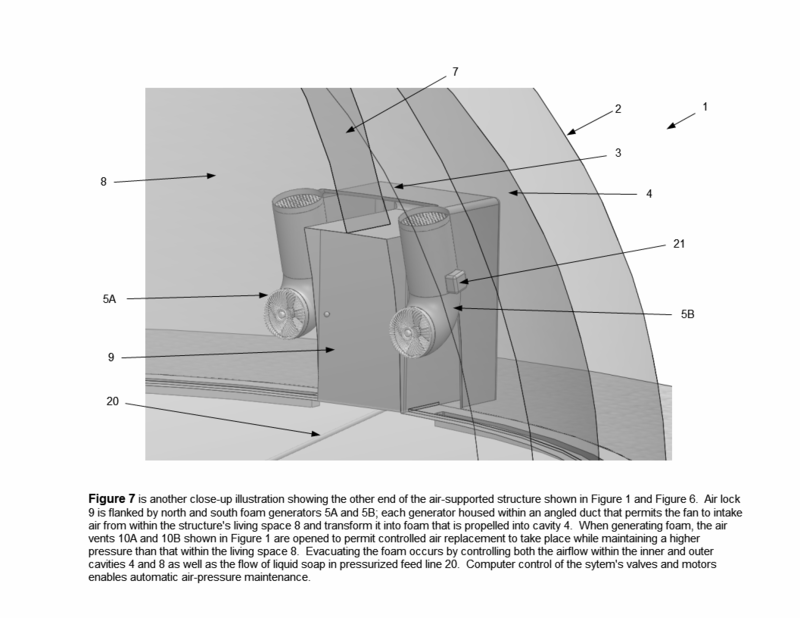 Reservoir 11 stores liquid surfactant that is used by the blowers in foam-generators 5A and 5B to create and propel soap-foam into cavity 4 (see figure 8). The large underground reservoir 11 can serve two functions. 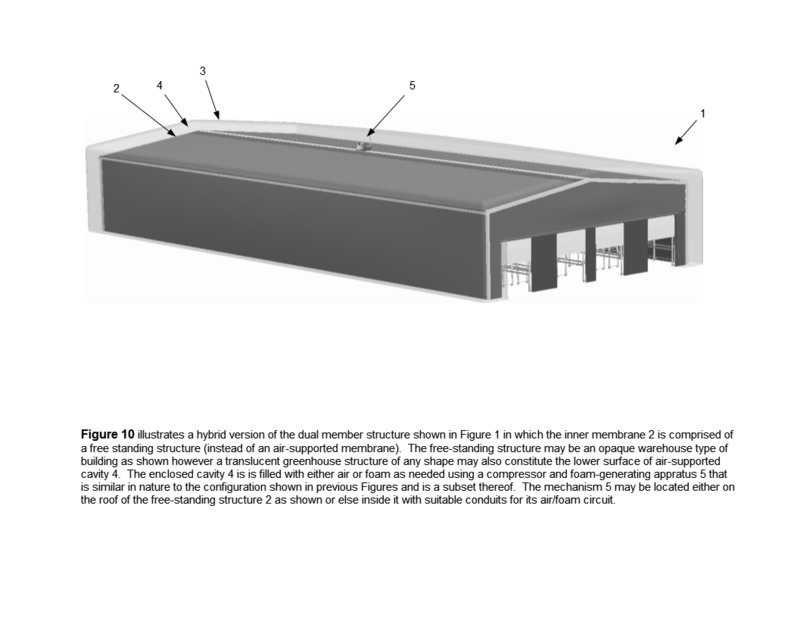 Its primary function is to enable the production of foam insulation as described above. Its secondary function is to act as a heat-sink that stores thermal energy for distribution inside the wall-cavity 4, thereby providing more efficient temperature control of the structure’s living space 8. To transport thermal energy stored in reservoir 11 into living space 8, soap solution that might otherwise be transported via pump 19 and feed pipe 20 to the foam generators 5A and 5B (for aeration into foam), is instead pumped directly into an overhead perforated spray-bar 30 (via coolant feed pipe 32). 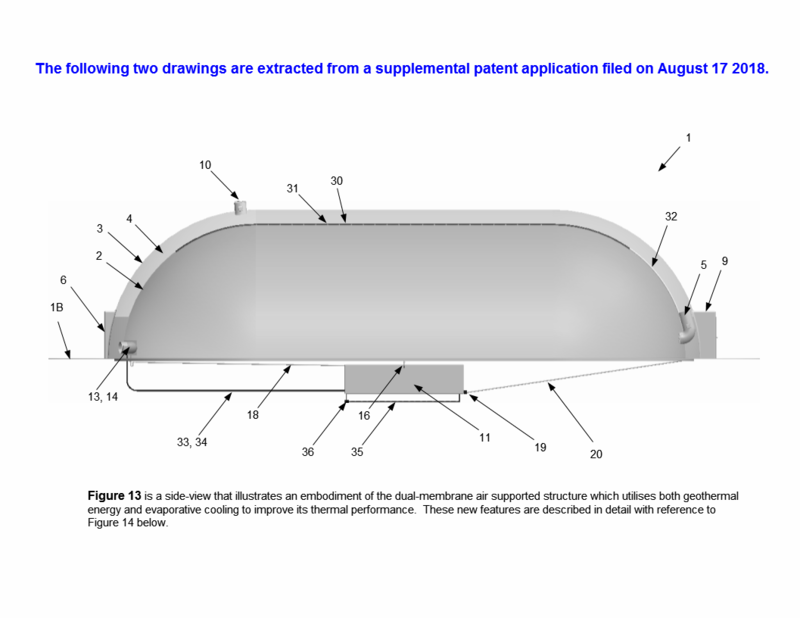 The spray-bar 30 is disposed along the summit of the structure’s air-supported inner membrane 2 and a plurality of closely-spaced nozzle perforations 31 are disposed along its sides. This configuration enables the liquid surfactant to trickle or cascade down the upper surface of inner membrane 2 [ see demo] whereupon it collects in trough 17 for draining back into the subterranean reservoir 11. The thin film of cascading liquid wets membrane 2 thereby transferring thermal energy from the underground reservoir 11 into the structure’s living space 8. 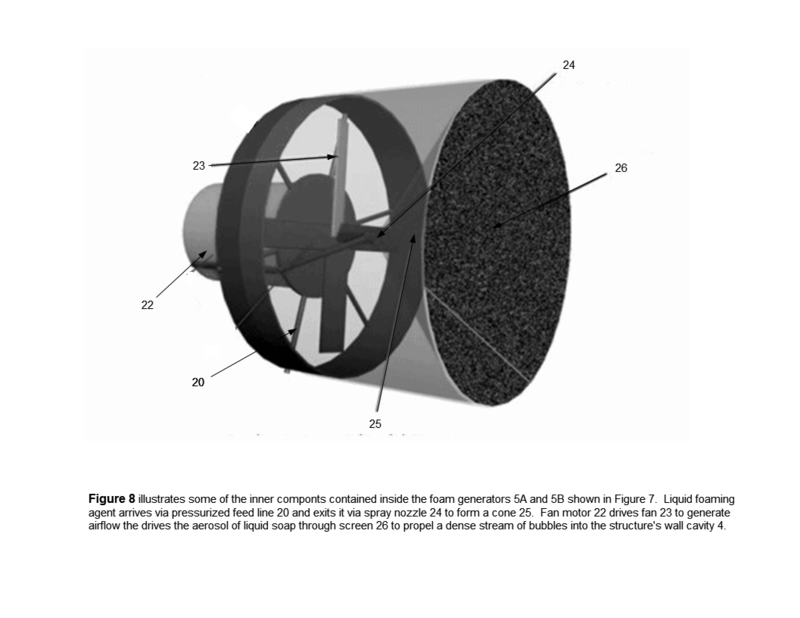 A further means and method for exploiting the thermal contents of soap reservoir 11 is to pump its contents through modified HVAC unit 13 so it can serve as a geothermal “heat pump”, thereby enabling it to blow conditioned air into living space 8. To enable this feature: feed and return lines 33 and 34 as well as a circulation-pump (not illustrated) are used to cycle the fluid through heat-pump 13. Yet another way to improve the structure’s overall thermal efficiency is to connect a serpentine pipe 35 to the underground soap reservoir 11. Pump 36 circulates surfactant solution through serpentine pipe 35 such that it exchanges thermal energy with the surrounding soil, thereby increasing the reservoir’s efficiency and holding capacity as a geothermal heat-sink. Another useful aspect of the invention is that it provides an air-supported wall cavity that can be selectively vented to the atmosphere. This feature enables the structure’s primary air-support blower at 6, its secondary air-support blower(s) at 5 and its wall-cavity exhaust vent(s) at 10 to transform the entire wall-cavity into a duct that vents stale air from inside the structure’s living space out into the atmosphere. To ventilate the structure, the system’s servo-controlled pumps and valves are closed so that no liquid soap is being pumped into the foam generators at 5 or being sprayed onto the inner membrane 2 (via the spray-bar 30 described above). Also; the servo-controlled air-valves in the upper cavity-vents 10 are opened, as are the air-valves between the main living space and the foam-generation blowers at 5. 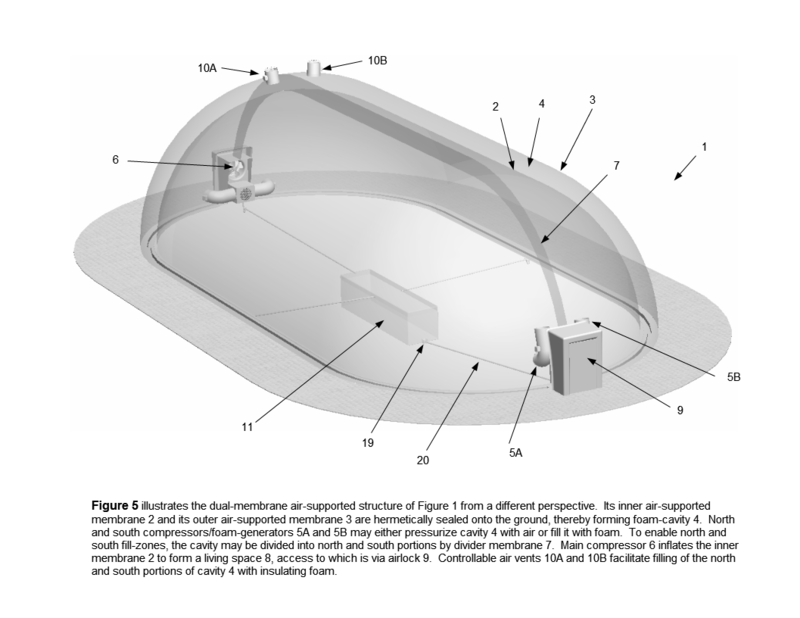 While the system is in this configuration, air blown into the main living space by the main air-support blower 6 will be forced to exit the structure via a circuitous ventilation path: >> it flows along the living space 8 >> into the foam generators 5 >> back through the length of the wall-cavity 4 >> and exits the structure via the exhaust vents 10. Computer control of the air-valve apertures at (5 and 10) as well as the air blower speeds (at 5 and 6) is used to insure the structural integrity of both air-supported membranes 2 and 3. 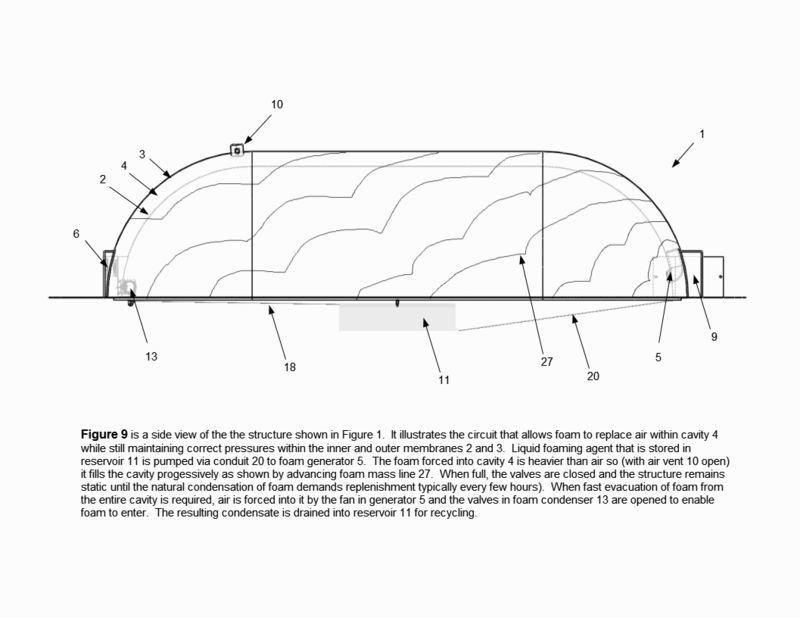 A second embodiment of the ventilated wall-cavity adds significant utility to the invention because it enables evaporative cooling over the entire surface of the air-supported structure’s inner membrane. To practice this mode of operation, the wall cavity 4 is ventilated as described above while simultaneously cascading a sheet of surfactant solution down its inner membrane via the spray-bar 30 (also described further above). Cascading a sheet of water over the large membrane surface, while simultaneously blowing a stream of dry air over it will cause significant evaporative cooling within the cavity; this evaporative cooling transfers heat from within the living space 8 (via conduction through membrane 2) and vents it to the atmosphere (via the exhaust ports 10). 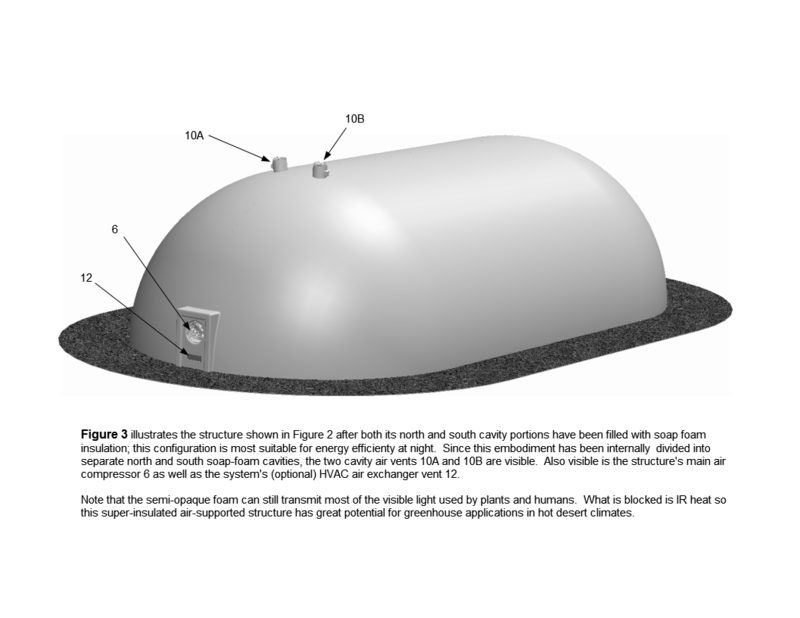 Note that this evaporative cooling effect can occur in addition to the geothermal cooling effect described further above. 1) You can change the slides above by either clicking on the on-screen arrows or by using your keyboard's left/right arrows. 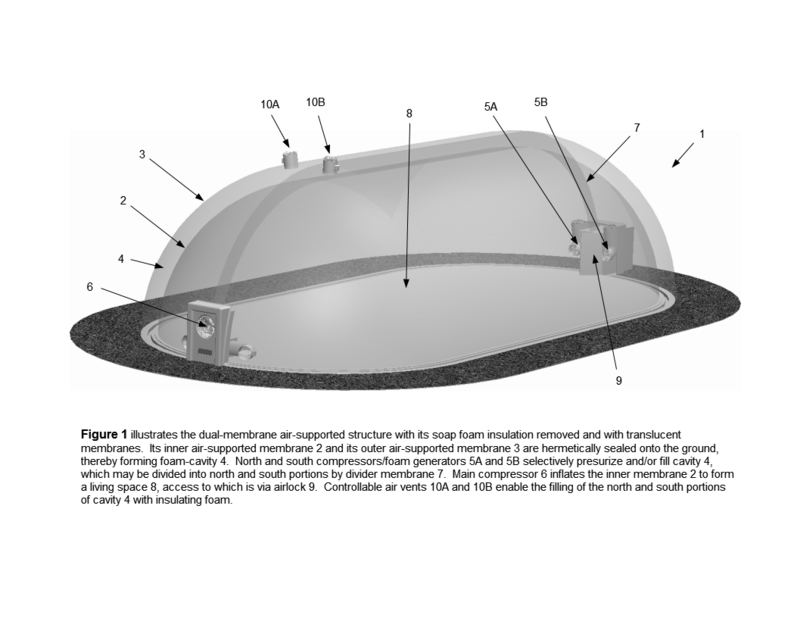 2) The soap-foam insulated structure shown in these slides is not a FoamDome (because it uses rigid membrane supports). 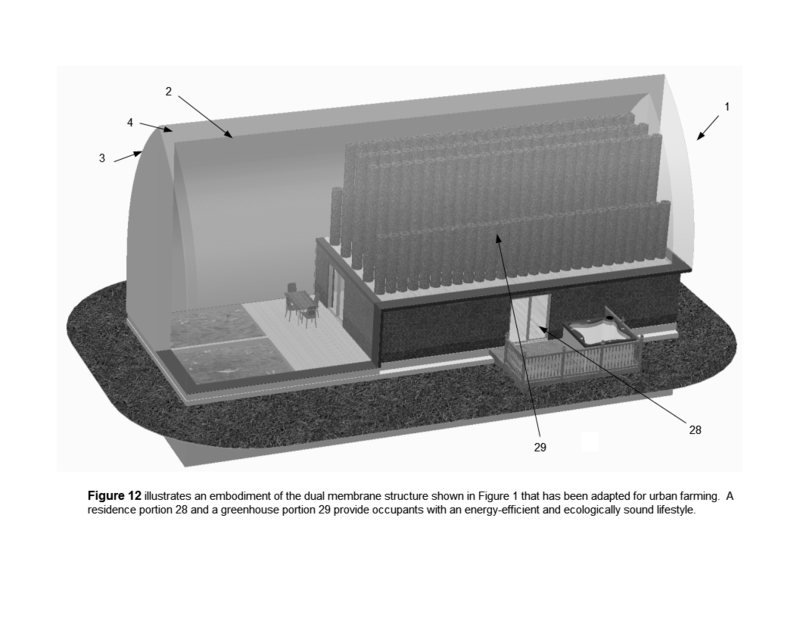 3) The aquaponic system is shown conceptually... our "Waterfall Farm" mechanism enables those tall hydroponic towers.